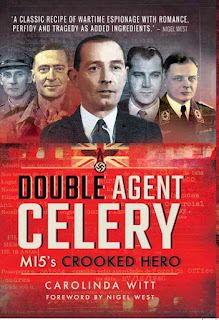 Double Agent Celery: MI5's Crooked Hero. Carolinda Witt. Pen & Sword, 2018. First off, I have to say that getting a copy of this book took both perseverance and patience. I had ordered a copy in late December and it finally arrived in late February. It was slated for release in Canada on January 19, 2018 but even after that date, there were no actual books in stock online or in stores (Chapters bookstore). I even went so far as visiting Foyles while I was in London in early February and they had not received any copies either. I could have ordered an e-book but I prefer actual books. As for the book itself, it is definitely interesting. Carolinda Witt is the granddaughter of Walter Dicketts, a.ka. 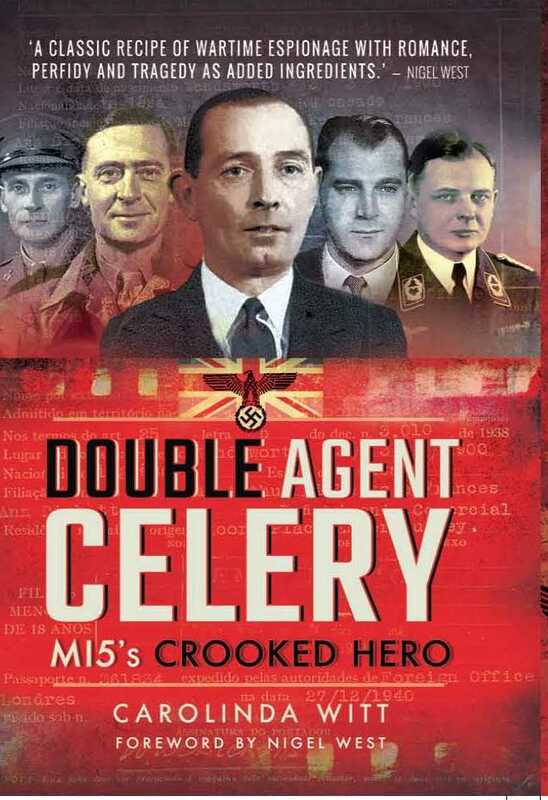 Double Agent CELERY. In the first part of the book, we learn about Dickett's early life, his World War I career and his shady dealings in the 1920s. He was definitely a rogue and a scoundrel! Dicketts had several mistresses and wives and seems to have left many of them with broken or resentful hearts. After several stints in prison, he did manage to redeem himself in the 1930s and when World War II broke out, had high hopes of being able to serve his country again in the RAF. Unfortunately, his criminal past was a hard pill to swallow for many in the military services. One evening, he bumped into a man at the pub and after a few beer, the two were fast friends. That man was Arthur Owens, a.k.a. Double Agent SNOW. And so Dicketts was introduced to the world of espionage. The author spends a fair bit of the book outlining the background and career of SNOW, necessary given the fact that the espionage careers of both Owens and Dicketts were so firmly intertwined. I've read several books on SNOW and his story is always complicated. Seriously complicated. That is the case in Witt's book as well. Witt does add to the story by having access to interviews with George Sessler, assistant to German spy master Nikolaus Ritter. This is a new source but does tend to add another layer to an already complicated story. One is left with the impression that Dicketts was a loyal Brit and did his best to serve his country, despite SNOW's attempts to discredit him. The book ends with an account of how Dickett's descendants (the offspring of 4 wives and 2 mistresses), many of whom had no idea that the others existed, managed to reconnect with each other. It makes for a fascinating tale. As mentioned above, I've read several different books on SNOW and that definitely helped me navigate through this book. The complexities of SNOW's story could easily stymie the average reader who may not be familiar with all of the different characters and situations. Witt has done an admirable job of setting the context for Dickett's story and one does feel, at the end of the book, that one has a deeper insight into the character and motivations of this complex man. re: Nikolaus Ritter - when Farago interviewed him in the 1960s, he showed Ritter some documents from the mysterious treasure trove of microfilmed Abwehr documents that Farago claimed to have discovered. Ritter was shocked that Farago had such documents as he thought they had all been destroyed. Does make one wonder if the treasure trove actually exists... even though no one else has ever been able to find it. the involvement of Coroner Bentley Purchase in several questionable MI5 situations: (a) falsifying the autopsy report for William Rolph (SNOW's former partner - he committed suicide and MI5 didn't want the Germans to get wind of that, as it might make them think that SNOW had been compromised) and (b) supplying MI5 with a dead body for Operation Mincemeat. Witt notes that Purchase was the coroner for Dickett's death - he apparently committed suicide by turning on the gas in his apartment. Was it suicide or something else? Intriguing question. Some history books simply churn through secondary sources and repeat the same errors from the past. I appreciate Carolinda's effort in referencing primary source material and actually adding something new to the story of SNOW and CELERY. She has also done an admirable job in bringing us the human element of the story, something that can be easy to miss amidst the sea of facts. These men were complicated characters, with mixed motivations and loyalties. 4.5 out of 5 - a well-researched and helpful contribution to the story of the Double Cross agents.